Personally, I don't need an excuse to eat chocolate and I'm not going to turn down a delicious chocolat from someone special on Valentines, but, in Pure Green's second buyer's guide, I thought I'd help you make a more sustainable, and still delectable, choice. The truth is, our relationship with chocolate isn't so sweet - you may be supporting deforestation, child-labour and illegal pesticide use when you bite into your favourite bar! Don't despair, many companies are using responsible cocoa, and I don't mean to be overly negative or sensational. But every decision we make as a consumer sends a message - I've researched a few chocolate companies and collected my findings here, making it that much easier to buy green. 2. Look for companies that support shade-grown or reforestation projects. This means that you are now supporting a company that doesn't chop down the rainforest to grow cocoa, or perhaps they are funding reforestation to grow their crops, which in turn supports biodiversity. Cocoa is meant to be grown in the shade anyway, like coffee, meaning that you get better tasting chocolate. 3. Lastly, look for fair trade. You'll recognize the little black and white symbol. The means that no child labour was used, and the farmers are being paid fair market prices. This allows independent farmers to use their own land as well. Some companies go one step further, and offer market shares to their growers! 1. Divine - These guys are pretty awesome. Besides having great packaging, 45% of their company is owned by the growers! Their packaging is biodegradeable too. 2. 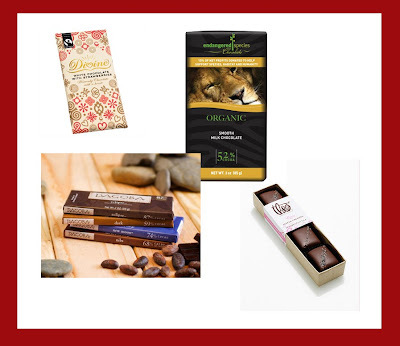 Endagered Species Chocolate: this brand was developed to help spread awareness about endangered plants and animals. Besides being fair trade, organic and shade-grown, their facility in the U.S. in LEED Certified. How great is that? Theses guys also have baking goods. 3. Theo: describe themselves as 'bean to bar' - they import organic beans into the U.S. and manufacture it there too. Most companies import the finished product from Europe. 4. Dagoba - Hand poured and hand wrapped chocolate. This company is very committed to the environment as well, sponsoring reforestation and ecology programs in Costa Rica, as well as green energy and urban greening programs in the U.S.
P.S. - for the Canadian contingent, also check out Cocoa Camino. also, for those from San Francisco, Mark from Pastry Smart found me on twitter http://www.pastrysmart.com/. Check him out for organic sweet treats in that area. Thanks for mentioning us in your post.